Do you have vivid or intense dreams? Do you often wonder why you dream, or what is happening to your body while you’re dreaming? Some people don’t ever remember their dreams, and others can talk about their dreams in great detail, almost as if they were watching a movie in their sleep. Either way, the brain is very active during sleep, and dreams are just a part of what’s happening when we sleep. When you’re dreaming, your entire brain is active, from upper structures all the way down to your brain stem at the back of your skull. Most dreams occur during periods of REM, or Rapid Eye Movement sleep, the final of the 4 sleep cycles your brain moves through during the night. The average adult will spend between 1 to 2 hours in REM sleep every night. During REM sleep, your muscles aren’t able to move, meaning that whatever happens during your dreams, your body will stay resting in your bed. However, your eyes will move rapidly, as if taking in all the scenes that you’re imagining during your dream. One area of the brain that’s often very active during dreams is the mid-brain limbic system, which deals with emotional processing both when you’re awake and when you’re asleep. During dreams, one limbic system structure that’s very active is the amygdala which is responsible for fear reactions. The hippocampus is also activated during dreams, and this brain structure is responsible for your memories. That’s why many dreams involve memories or people you know, though often these are imagined in strange or twisted ways. While the midbrain structures are active during dreams, the cortex, or front brain structures are also active, and they control the content of the dreams, creating the images of loved ones, the feeling of flying, or monsters that we’re running from. Other parts of the brain that are very active during sleep include the visual cortex, which helps us “see” our dreams, and even our motor cortex shows activity, as if we really were running during our dreams. One area of the brain that’s not very active are the frontal lobes. These areas of the brain are in charge of rational thought, judgments, emotional control, and an understanding of the laws of space and time. 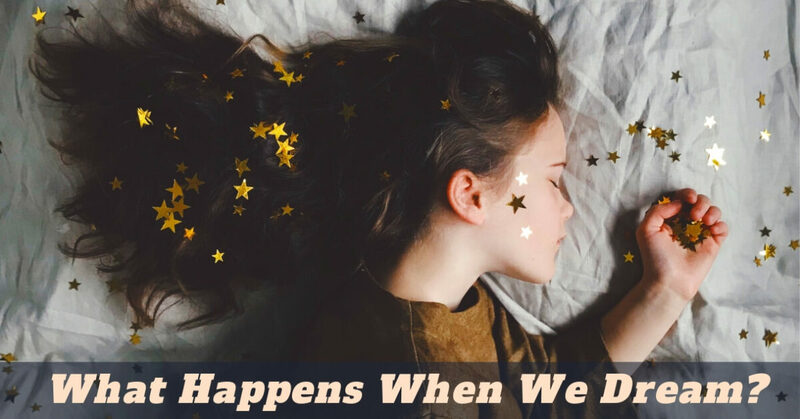 When these parts of the brain are inactive, as during dreams, we’re more likely to accept the crazy situations that occur in dreams, think they’re really happening, and allow our imaginations to run wild throughout the night. Many people don’t remember their dreams, and some believe this is a coping mechanism to help the brain distinguish between what is real and what is imagined. We still don’t know for sure why we dream, but there are several different theories as to why we dream at night. During REM sleep, there are random cells firing erratically throughout the brain, and some scientists hypothesize that your dreams might actually be your brain trying to make sense of this random brain activity during sleep. Another theory is that dreams are actually an attempt by your brain to sort through complex emotions or feelings that you haven’t been able to process during the day. Your subconscious may be able to use these dreams to cement memories or interpretations of events, and help you be more emotionally present during your waking hours. Others believe that the explanation might be simpler, and that since dreams become more frequent during the early hours of the morning rather than when you first fall asleep, your dreams might actually just be your brain’s way of preparing for the day ahead, and making sure all systems are ready for the coming day. Whatever the cause of your dreams, if you’re not sleeping well, you’ll wake up tired and groggy each morning, and struggle to get through the day. Your relationships will suffer, and you’ll have poor job performance. If you’ve been having trouble drifting off to dreams, visit us today at Sound Sleep Medical for a sleep assessment. Our team will have you dreaming again in no time, and waking up refreshed and ready to face the day.